Texas Power of Attorney Forms allows one person to grant another party the right to make decisions and act on his or her behalf. The person doing the appointing is called the “principal” and the person he or she appoints is called the “agent” or “attorney-in-fact.” There are many types of powers of attorney each geared to the issuer’s needs. Some powers of attorney allow you to confer all of your financial power to another, while others are for more limited situations, such obtaining title to a vehicle. In all cases, you should think about who you want to act as your agent because they will have a lot of responsibility over your affairs. Durable (Financial) Power of Attorney – This is a type that confers broad financial powers on your chosen representative. It will also continue to be in effect if you become incapacitated unless you revoke it before. General (Financial) Power of Attorney – This is also a type that allows you to confer broad financial powers, however, unlike the durable form, it terminates automatically if you become incapacitated. Limited Power of Attorney – This form of POA is less broad and can be tailored to meet your specific need to appoint a representative for a limited transaction. Medical (Health Care) Power of Attorney – This form gives you the ability to designate a loved one to handle your health care issues and decisions in the event you can no longer communicate your wishes. Guardian of Minor Power of Attorney – For the use of a parent who would like to delegate the care of their son or daughter in the care of someone else. If the parent would only like to select someone else, in the chance they become incapacitated, they should fill-in the Designation of Guardian for Incapacitation. 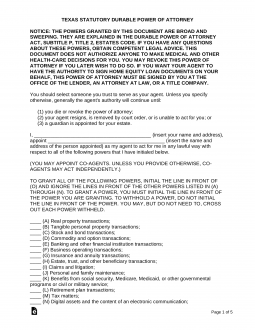 Signing Requirement: If only one (1) parent is able to sign, the power of attorney must be witnessed by two (2) subscribing witnesses. It is suggested that the document be notarized. Real Estate Power of Attorney – Choose an agent to negotiate and handle the transaction of real property. This form may also be used to choose someone to make decisions on the repairs, leasing, and evictions of the premises. Revocation of Power of Attorney – This form is used when you have an existing POA that you wish to terminate. Make sure that your agents have a copy of this signed form so that there is no question that they are no longer to act under the original POA. Signing Requirement: No statutory requirement. However, it is suggested that the document is notarized. Tax Power of Attorney (Form 86-113) – This form is for use when you wish to designate a tax professional to handle your tax matters. Vehicle Power of Attorney (Form VTR-271) – This form is for use when you wish to designate someone to handle your vehicle issues with the Texas Department of Motor Vehicles.